THE RED-HOT Snowden stable claimed four of the first five races at Kembla Grange on Tuesday January 3, and added a further success at Wyong on Wednesday to start 2017 in flying fashion. Ebenos brought home the winning quartet while making back-to-back victories in the Tullimbar Pty Ltd BenchMark 65 Handicap (1200m). The victory followed wins for Right As Rain in the three-year-old maiden handicap (1000m), Archangel in the Auld Lang Syne F&M maiden handicap (1300m) and Balestrand in the BLG Business Advisers CG&E Maiden Handicap (1300m). 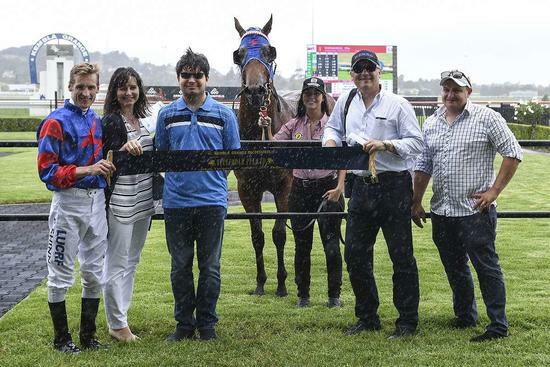 Promising three-year-old filly Right As Rain secured an impressive win first up from as the speedy daughter of Snitzel took advantage from the inside alley under Blake Shinn and led for an all-the-way length victory ahead of Babe in Boots. Bred and owned by Don Storey, Right As Rain appears to have the inherited the family speed genes, being a half-sister to multiple Group winning sprinter Rain Affair, who won 12 races and over $1.5 million in prizemoney. Shortly after Right As Rain’s maiden victory, Archangel snared a $30,000 race of her own when cruising clear in the China Horse Club colours. The race-favourite took a bit of time to get in gear under the guidance of Blake Shinn but once she got going in the home straight, it was an easy assignment for Lonhro’s most expensive yearling, who sold for a record $825,000 at Easter in 2015. “It was a patient ride and a nice win…She was doing her best work late so we’ll now slowly step up in trip, and let her come into her own,” explained co-trainer Paul Snowden. Rejuvenated gelding Balestrand made all the running to add a third success in race 4, with the move to geld him last year now paying dividends according to Paul Snowden. “Prior to having the ultimate gear change, he had a lot of head issues and just wasn’t concentrating or putting in, but since being gelded, he’s really switched on and we’re seeing the benefits of that now,” he said. “It was a really good trial that he came through, as the winner of that won at Gosford the other day for Ronny Quinton, so we were quietly confident that he could get the job done as long as he did everything right. The winners continued to flow the following day at Wyong, when California Fortune led from start to finish in the WRC $30 Mid Year Membership Join Now Maiden Plate (1350m), in a race where Triple Crown’s She’s Demanding finished strongest of the field to claim fifth under Nick Heywood, offering great encouragement before being stepped up in trip.